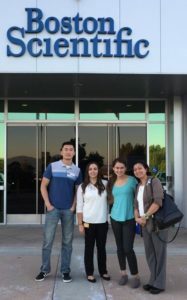 Our tour guides, Carolina, Alyssa and Chris, showed us the process flow of two critical parts of the Spinal Cord Stimulation (SCS) System, the small implanted pulse generator (or IPG) and thin wires (known as leads). These parts are placed into the body to convert pain into a tingling feeling. The process of assembling the IPG and leads are complex, but it appeared seamless due to their organized linear assembly flow and application of the lean approach. The company heavily embraced the lean principles with 5S, poke yoke, Kanban just to name a few. It is applied from our tour starting point, their think room, to their clean room & operation floors as well as the shipping department. The Industrial Engineers at BS in partnership with the operations are really integrating these principles effectively. 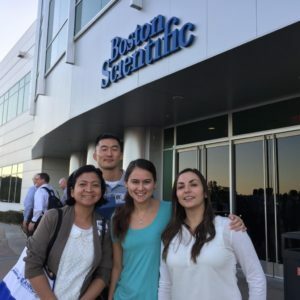 Thank you to Boston Scientific and their IEs for allowing us to visit their facility.